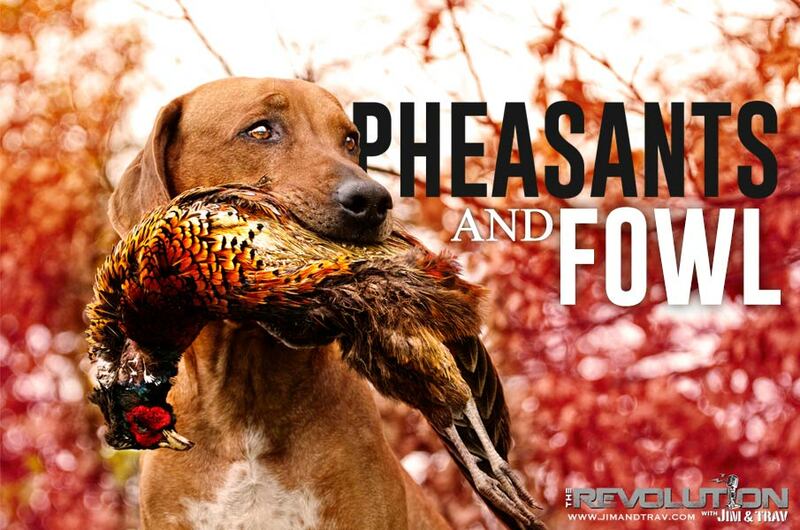 This week on The Revolution with Jim and Trav presented by Outdoor Channel, Sportsman Channel and World Fishing Network, we're geared up and ready to pursue pheasants and waterfowl. So, whether you're looking to occupy an open field for pheasants or headed to hunker down in a blind for ducks, we've got you covered with advice from savvy shotgunners that'll certainly improve your wing shooting skills this season. Talking points will include calling, decoying, specific upland and waterfowl loads, locating prime hunting locations, plus loss of CRP and predator management. Our veteran panel includes Travis Frank of The Flush, Charlie Holder from Sure-Shot Game Calls, Nick Hoffman with Nick's Wild Ride and survival expert Tim MacWelch. Pheasant hunting is as much of an American tradition as baseball. More than 2 million pheasant hunters flood the fields each fall in pursuit of the King of Gamebirds. Travis Frank of The Flush, Sundays at 5:00 p.m. EST on Outdoor Channel, joins The Revolution to talk pheasant hunting and limiting factors that are impacting game bird populations. “I get to hunt all over the country for birds. The number one thing that applies to a good hunt is habitat.” Travis analyzes dwindling habitat, the loss of CRP acres and the conversion of grasslands into crops and explains how it affects wildlife and, more specifically, game birds. He also discusses the role that predators play in game bird populations, the overall rise in predators across the country and management of these species. Regardless of habitat loss and predators, there is still plenty of fantastic hunting to be had this fall. “The one nice thing about bird hunting is that you’re going to them, you don’t have to wait. If you’re deer hunting, you’re sitting and waiting for the conditions and the wind direction to be right. With birds, you just get to go out there and make it happen.” Travis says that hunters need to switch up their strategy in order to be successful, right now. “This time of year across the Midwest, birds get smart in a hurry.” He encourages public land hunters to differ from the norm; don’t park in the same spot everyone else does, don’t walk in from the same direction. Approaching a piece of property from a different direction can throw the birds off and put you at an advantage again. “I enjoy the late season hunts because when you find birds, you generally find big numbers.” Tune in for more tips and advice from Travis Frank of The Flush. Do you really need a lanyard full of calls to be a successful waterfowler? “It’s all about having the variety and having the right tools in your belt,” says Charlie Holder, President of Sure-Shot Game Calls. To a novice that might seem excessive, however Charlie says that duck hunting is a lot like fishing and the ability to change your presentation is the key to success. He’ll explain why the average duck hunter has at least 8 calls with them to choose from in the event that one doesn’t produce the results they are looking for. Then get an in-depth look at the Yentzen One. This call is in a league of its own and is virtually indestructible. It is built from a composite material that is rigid, it’s assembled using a patented SCREW-LOCK design and has an inset customizable band with Cerakote finish. No other company in the duck call industry has ever produced a call like this before. Charlie encourages listeners to head to Sure-Shot’s YouTube page to see for themselves how tough this call really is. A baseball bat, a pick-up, a shotgun and even a John Deere 8430 couldn’t damage the Yentzen One. Find out more from Charlie Holder of Sure-Shot Game Calls. Nick says he is currently filming for season 2 of Nick’s Wild Ride and gives listeners a preview of what’s to come. From Alaska to Africa, a traditional driven pheasant hunt in England, gators in Florida and everything in between, Nick says they are stepping it up for Season 2. You can tune in as Nick hunts game across the globe and explores each locale he hunts searching out the most interesting places, people, food and culture.